Skeleton clock, silver movement with sub-second dial, black and silver case. Options: BC977 7-875" x 8-1/2" 171.00 Laser engravable aluminum plate. Individually gift boxed. Clock movements are guaranteed for life. Batteries included. Traditional glass and rosewood piano-finish clockwith gold metal accents. Options: BC956 7" x 7" 102.00 Laser engravable brass plate(s). Individually gift boxed. Clock supplied with lifetime guaranteed quartz movement. Batteries included. 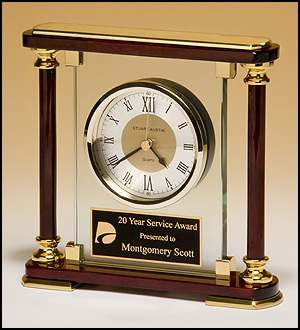 Versatile Clocktwo engraving plates toaccommodate extra copy Options: Plate Size BC3 6-3/4" x 8-1/2" 4" x 6" 91.50 Laser engravable plate(s). Individually gift boxed. Walnut stained piano finish vertical wall clock. Options: BC58 10-1/2" x 13" 144.00 Waterfall bezel with glass lens, gold dial and three hand movement. Laser engravable plate(s). Individually gift boxed. Limited availability in 2013, contact us for status.